It’s not easy to know how to talk to an ex and have a proper conversation with him or her, because more often than not one of the two still has feelings for the other. After having gone through a breakup, there is a high risk for becoming depressed. In truth, most breakups are unexpected and change your daily life overnight. This sudden change can turn things upside down in your life, and this is why it’s imperative to take action to make sure that the consequences are minimal. Communication is essential when you want to get back together, so you have to do your best to hide your emotions so that you don’t unveil your intentions just yet. In truth, if you’re too direct when you two talk, your ex will know what’s up. You’ve got to be stealth! As I explain in my Audio Seminars on How To Get Back With An Ex, communication is the very foundation of a solid couple and if it wasn’t strong up until now then you have to make an effort. Even if you’re no longer together it’s still possible to contact your ex and talk to them about the breakup, but it’s not to try and convince them to take you back. Under these circumstances, it’s normal to wonder how to talk an ex again and what to say; What subjects are good and which ones should you avoid in order to put the odds in your favor? Ideally, when first trying to rekindle with an ex you should have a conversation in which neither of you bring up the relationship you used to have together. Although this sounds difficult, trying to consider your ex as a friend is the best way to begin recreating complicity between you two and can allow for the conversation to flow with ease. Nevertheless, it’s hard to set aside the relationship you had as long as your feelings for your ex are still present… Please remember: this is especially true if you get back in touch soon after the breakup. In this situation, it’s imperative that you don’t focus on the problems that you had been having; you should focus on the best moments. One of the most common issues that arise when people are working on getting back together is a lack of patience. Should I talk to my ex about the breakup, for instance, is a question that I am asked all the time as people try to push their ex to commit once again. The best is still to avoid talking about any of this and to focus on subjects that have nothing to do with the breakup. Because, yes, when you want to get back together, communication is crucial, and we will dive into more detail about that in this article. As human beings, communication is crucial because it allows us to express ourselves to one another. It can be verbal of course, but also through alternative gestures, attitudes, and even our posture. We’re going to focus on the reasons why it’s important to have dialogue with your ex when you want to have a successful attempt at getting back together. In relationships, communication is essential because it is what allows us to right our wrongs. While you may want to speak to your ex immediately following a break up, it’s important to wait until you’re strong enough to listen and to analyze your ex’s words even if they’re hurtful. Waiting can help you to understand why the person you love decided to leave you, but it’s also a way to show that you’re ready to listen to their wants and needs, and that you’re not flooded with bitterness. If you can show your ex that you’re able to keep your cool and that you’re more attentive, you’re completing the first step to meeting their expectations, and you’ll be sending a strong message. That said, “communication” doesn’t mean that all topics are fair game when you’re talking to your ex and want them back. You’ve got to avoid fights, and don’t bring up bad memories either, especially if you’re starting to reconnect post-breakup! I’m going to outline the subjects you can talk about with your ex, after the no contact or right after the separation! If you want to succeed at your attempt at getting back together and steal your ex’s heart again you shouldn’t completely act like the breakup didn’t happen or as if you are insensitive to your exes decision. One of the first steps consists of accepting the breakup so that you can show that you’re capable of changing things and meet your ex’s needs and expectations. There was a crack in your relationship and now you have to construct a new story so make sure you’re not living in the past. To do this, communication and calm exchanges are crucial. It is very common for distance to grow between you and your ex after a breakup. If this isn’t the case, you have to think about making it so in order to take a step back to gain an unbiased perspective and to give your ex some space to breathe. During this period your ex is going to reflect on their future, make important decisions and maybe even change their attitude. You therefore have to keep in mind that the person you want back and the one you used to know are not the same! This is exactly why it’s so important to put things into perspective and talk about the breakup with your ex. This way you can kill two birds with one stone. You’ll discuss the separation and reestablish contact, which in turn will benefit your attempt at getting back together. Getting in your ex’s head is one of the trademarks of the CORMONT method. We actually put a lot of emphasis on the psychological aspect of the process; so let me remind you of the importance of analysis. It’s crucial to understand what your ex wants if you want to meet their expectations. Your task is relatively straightforward; you have to put yourself in their shoes and learn to think like them. By talking about the breakup with your ex you’re going to learn what they resented in you, their disappointments and what made them decide to end the relationship. Brandon, a client I’ve been working with for about 7 months, used the above approach and it worked like a charm. His ex of three and a half years was truly about to tell that he’d developed a rounded perspective of the relationship and the breakup. Slowly, she became confident in his ability to change and to keep that change. Today, they’re still together. One of the most important phases after a breakup (when you want your ex back) is the change that you’re going to have to bring about. A breakup never happens without reason and your ex-partner had their reasons, good or bad, to leave you… Even if you don’t fully understand these reasons, realize that it’s never easy to decide to break up with someone. Something had to have pushed your ex to make this radical decision and this proves that they were deeply unhappy. Reviewing the situation and looking inside yourself are essential for no longer making the same mistakes. In order to figure out which elements you really need to work on you have to understand the breakup and this happens through communication. By the way, when you’re talking with an ex, be careful to never harass them! I’ve coached countless people who were very close to sealing the deal only to see most of their efforts go to waste because of a single moment of weakness during a conversation with their ex! Don’t just bring up any subject with your ex. Instead of asking yourself should I talk to my ex about the breakup, don’t waste time; you have to figure out your bad habits and take action to start fixing them. These are the things that were stopping you from making the person you love happy. You won’t be able to get your ex back by acting the same way you used to. Even if you get back together, the new relationship won’t have a solid foundation. What you do need to do is to give your ex a new image of you; the new and improved version of you. The memories are painful and the breakup is maybe still fresh so you have to create a new atmosphere in which you can rebuild as a solid couple. You’re going through a tough period. You’re at your wit’s end and it’s completely normal to be hurting. You’re feeling pressure from your loved ones that are constantly asking you how you’re doing and they want to know more about your breakup. You’re receiving advice that you don’t need and all of this is just making matters worse. On top of that, as you’re having trouble taking a step back and putting some healthy distance between you and your ex, you’re making mistakes. Maybe you’re going too fast or you’re not using the most appropriate technique for your situation. Talking about your breakup with your ex or with someone else, as long as you’re honest and sincere, will help you to put things into perspective and analyze the situation. Whether you want your ex back or you want to move on, you have to use logical methods. Don’t let this heartache control your life, because letting yourself become depressed won’t help anything. What should I talk about with my ex? Even if you had spent years together, there is one question that is still going to bug you under the current circumstances: what to talk about with your ex. What seemed natural just a few weeks ago has become really confusing and you don’t know where to start. Breaking up has created various roadblocks, but you’re going to break them down one by one and once again achieve natural and pleasant conversation. The idea of talking about the breakup with your ex isn’t always the worst thing you could do, but let’s be clear; it’s definitely not the best idea unless you have a clear plan. As it is the most recent thing that happened between you, some people can’t be stopped from talking about it. When that happens, you have to avoid bringing up certain things such as how depressed you feel. Even if it’s hard, it’s better to focus on your progress. 1. It’s important to communicate that you’ve understood and accepted what lead to the breakup and that you’ve been able to analyze the issues and begin to make improvements. 2. To take it a step further, you can show your ex that you’ve started to do things that put an end to these negative elements. 3. If you had acted out during the breakup now is the time to present your apologies or explain that your emotions had gotten the better of you. 4. You can also explain that other couples have gone through breakups as well and are able to bounce back and start over. That said; you have to be careful with how you present this. Be very subtle, otherwise it could turn against you. Don’t try to reason with your ex to be with you. If they come back, it must be their decision. Trying to guilt them into reconsidering the relationship can end up pushing them further away. 5. If you really don’t know how to talk to an ex again; let me just tell you that it’s best to avoid subjects that highlight your past disagreements. By doing so you can talk about the practical aspects of your breakup such as who keeps the cat and who gets the car. For now, only bring up the things that you know you two will agree on! Ideally, you should avoid talking about contentious topics during the initial painful period for the sake of both of you. There are many subjects that can help you to better communicate with your ex or the person you love. I know it’s not easy to find a topic because you’re often afraid of fanning the flames. 1. Talk about your new activities and your personal reconstruction. Avoid talking about new people you’ve met or the fact that people are hitting on you left and right. It’s pointless and if you really have set your sights on someone, your ex will think that you’re not serious about being with them! 2. You can talk about a special memory you two shared, even if this is a reference to your relationship. 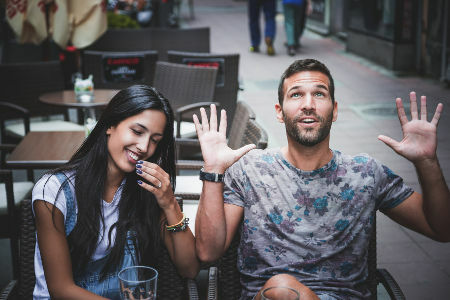 The idea isn’t to talk about your relationship but rather to talk about that special moment you shared to help you reconnect. 3. To start a conversation with your ex, you have to choose a subject that they will like. For example, talk about one of their passions. If your ex likes football you could bring up one of the most recent games. But if you’ve always hated football, don’t bring it up or else they’ll think you’re just using it to make them want you. 4. Sometimes you have to be a bit of a manipulator with your ex and you can talk about the future. Show them that you have the same goals and desires because this can bring you two closer together. 5. And lastly, when you’re talking to your ex, don’t forget about their friends and family. Without being a boot-licker, ask how the important people in their life are doing. These ten topics of conversation with your ex will serve as ways to launch dialogue between you and to communicate peacefully. It goes without saying that these aren’t the only things that you can talk about and based on your situation, you can choose all kinds of things to chat about. I wish you a good conversation with your ex and don’t forget to ease tensions! Your coach for figuring out how to talk to an ex again.